Rue du Collège is a street that previously bore the names Rue des Cimetières and Rue André-Désilles. 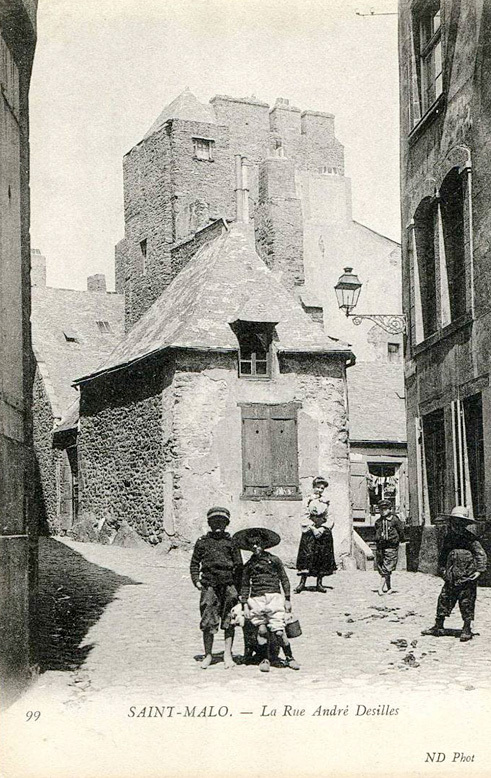 It was called “Rue des Cimetières” because this top part of the rock on which Saint-Malo’s old quarter was founded from the 12th century onwards was where the cemeteries were located. At No. 2 there is an impressive portal in the classical style which forms part of the old Hôtel de Plouër. It is decorated with a mask and a pediment made from limestone. In 1670, the municipality of Saint-Malo, or “Communauté de Ville” as it was then called, acquired the site where the large cemetery was located in order to build a town hall there. However, due to a lack of funds, it sold the site in 1697 to a rich ship-owner, Pierre de la Haye, the Count of Plouër. He had a large residence built there with a central courtyard and annexes. His inheritor sold it in 1714 to François Le Fer de Beauvais, who was one of the leading traders in Saint-Malo at the end of the reign of Louis XIV. Among other things, he was the Mayor of Saint-Malo from 1731 to 1738. In 1808, a group of priests purchased the property: one of them was Jean-Marie Robert de La Mennais (Saint-Malo 1780 - Ploërmel 1860). The building became an educational institution, which for a long time was called the “Collège”, and is now a secondary school called the “Lycée Institution Saint Malo – La Providence”. Above the street, an overpass links the various buildings of the institution, which expanded around 1900. The old chapel which extends in the direction of the cathedral was built in 1937.